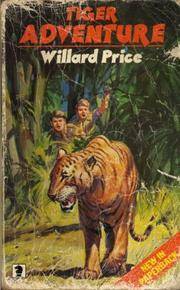 Willard Price’s ADVENTURE series involves the daring escapades and exotic locations visited by brothers Hal and Roger Hunt in their quest to find animals and bring them back alive to sell to zoos. There’s a wonderfully effusive and affectionate writeup on them here at the blog of a Mr A. P. Salmond. TIGER ADVENTURE was the first non-picture book I ever read, in Balham library at about the age of 3. And when the teachers at my primary school agreed to release me from the stultifying bonds of the Green Reader series and go read any book I wanted from the school library I felt overwhelmed by choice and reached for an old friend, CANNIBAL ADVENTURE. There were just over a dozen books in the series, and over the years I read them all, and re-read them, and re-read them. I also remember the language making its way into my own stories… great manly expressions like “he blacked out” or “The men pulled lustily but they could not budge the snake”. When I was around 13, I realised that I’d read WHALE ADVENTURE so many times that I could quote whole passages and visualise them on the page. And I realised something about my brain – I remember things visually. I remember text by its layout, by the shapes of the paragraphs, the islands of text in the page-coloured sea, even the little rivers of white running down past the words. The first image (above) is of the cover of TIGER ADVENTURE as I first saw it in 1977 at Balham Library, and below left is the cover of the one I found today in Oxfam in Horsham and bought for 99p! How come we’ve never bonded over this before??!! I had all these as a kid – loved them. Have a feeling Penguin are publishing a new modern version…. I can see Hal and Roger as rappers on a luxury yacht. Or beaming animals up to their orbiting mothership with lime-green wrist-contraptions. Or a gritty “reboot” of the franchise, with duct-tape and frowning toughs in a grimy Deptford lock-up.